Located on Appledore Island at the Isles of Shoals, the Appledore House was built in 1847 by Thomas Laighton and Levi Thaxter. It opened June 15, 1848. The Appledore became a busy resort, and in 1905 delegates in Portsmouth for the Russo-Japanese Peace Treaty discussions visited for a reception. The hotel was lost to a fire in 1914. According to Celia Thaxter, in Celia Thaxter, Among the Isles of Shoals [Boston: J.R. Osgood and Company, 1873], as late as 1873, "Philip Babb, or some evil-minded descendant of his, haunted Appledore." 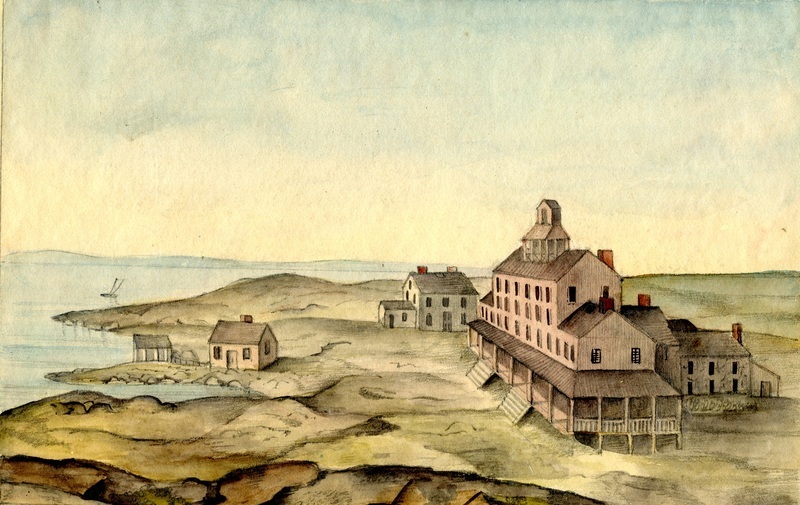 ~ Sarah Haven Foster (1827-1900), “Appledore House, Isles of Shoals,” Portsmouth Public Library's Online Archives, accessed April 21, 2019, http://portsmouthexhibits.org/items/show/705.